Who doesn’t love a good thick juicy burger? 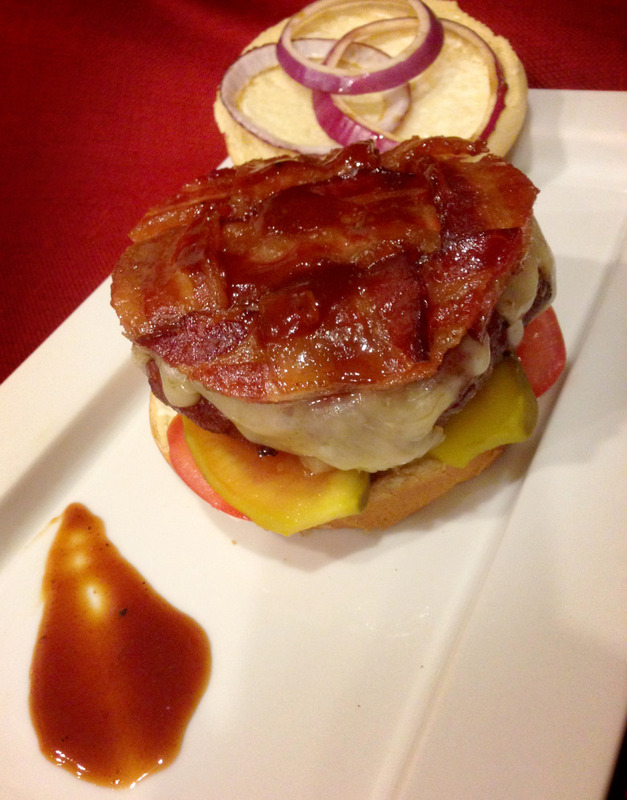 This Pig Candy Burger is one of my favorite guilty pleasures. If you’re not concerned about your waistline and you’re looking for that wow factor with your friends and family… light up your GMG and get cooking. Step 1) Mix your brown sugar and BBQ rub together. Then lay your bacon in a disposable tray alternating with a thin layer of the sugar/rub mix (like making a bacon lasagna). If you don’t have a disposable tray you can fill a large ziplock bag with the bacon and the sugar mix and shake so all pieces are covered. Let rest in refrigerator overnight (or at least for 3 hours). Step 3) “Bacon weaving:” take 3 pieces (per burger) of your brown sugar marinated bacon (aka Pig Candy) and cut them in half. Make a simple weave (as seen in the picture). Place your bacon masterpieces carefully on a wire rack and over a tray. Step 4) Set your GMG to 275 degrees and place the tray with the bacon in your smoker for about an hour—up to an hour and a half. You will know the bacon is done when the fat is translucent looking and the sugar is starting to bubble on the outside. (If you want to get fancy use a lid to cut your weave into the perfect shape for your burger. Step 5) Smoke your burgers for 30 min at 275. When the internal temperature of your hamburger hits 135°, turn you GMG up to 450 and grill until the internal temperature hits 160. During this time you can also add your onion slices to the grill—optional. Then turn your grill down to keep your burger warm and add cheese and your bacon weave. Step 6) Final Assembly. I keep my burgers pretty traditional adding mayo, pickles, onions and a little GMG Pitmaster sauce.